A new study from Dr. Konstantinos Farsalinos looking at existing evidence on the metal emissions from e-cigarettes has determined that vapers don’t need to be concerned about metal exposure. The previous findings that e-cigarette vaper contains trace levels of metals – undoubtedly from the atomizer coil and the surrounding material – were met with the predictable onslaught of ill-informed hysteria, but the new risk analysis puts the fears into context through comparisons with maximum permissible levels for medicines and occupational exposure. For example, vapers’ exposure to chromium, cadmium, copper, nickel, lead and cadmium was between 2.6 and 37.4 times lower than the maximum allowable levels in inhalable medicines. Researchers used existing data on metals in e-cigs along with USP limits for inhalable medicines, minimal risk levels and occupational exposure limits to estimate the risk for vapers, using an extreme assumption of 1,200 puffs per day. Levels of exposure for vapers to metals with inhalable medicine limits were between 2.6 and 37.4 times lower, with only one e-cig exposing users to 10 percent higher levels of cadmium (only under the assumption of 1,200 puffs per day). Levels of exposure to other metals, based on a study that didn’t appear to control for background (ordinary air) concentrations, were between 25 and 49,000 times lower than established safety limits. The authors conclude that concern about metal exposure from vaping – for first-hand users and especially for bystanders – is unsupported by the available evidence. The study (available in full for free) was designed to provide some much-needed context for concerns about vapers’ exposure to various metals. Using data from two previous studies (one from Goniewicz et. al. and another from Williams et. al. ), the authors used the United States Pharmacopeia (USP) permissible daily exposure limits for inhalable medicines, the minimal risk level (defined by the Agency for Toxic Substances and Disease Registry) or the National Institute of Occupational Safety and Health’s (NIOSH) recommended exposure limits to determine risk, depending on which had recommendations for the specific metals. For vapers' average exposure, previous research on the size of puffs taken and the average liquid consumption per day was used to produce an estimate of 600 puffs per day for a vaper. However, this is very open to individual variation in the number of puffs taken, so the researchers doubled this figure for the purposes of the study, calculating risk for a pretty unrealistic estimate of 1,200 puffs per day – this makes it very much a worst-case scenario calculation. Finally, it’s worth noting that the Williams et. al. study only tested one cartomizer and neither reported the background levels in the air nor made it clear whether the reported quantities of metals in e-cig vapor took this into account. In contrast, the Goniewicz et. al. study tested 12 different e-cigs and did report background levels, allowing corrections to be made for the quantities of metals in the air anyway. Because the Williams study didn’t offer such values, the uncorrected results were used in this study – this means that the results for this device are almost definitely overestimates. Overall, the metals present in e-cig vapor were well below allowable limits for medicines or other exposure limits, with only cadmium being present in one e-cig at levels marginally exceeding the limits for medicines (but only with the unrealistically high number of puffs used as an estimate in the study). The authors reported the results for the individual metals separately, offering a detailed look at each of the detected chemicals. The more reliable Goniewicz et. al. 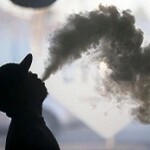 study only found three metals in e-cig vapor – cadmium, lead and nickel – whereas the Williams et. al. study found 13 – aluminum, barium, chromium, copper, iron, lead, manganese, nickel, strontium, tin, titanium, zinc and zirconium. Cadmium is present in ordinary air, and the fact that it's also in soil means that smokers are exposed to it too. It’s a known human carcinogen, and has been linked to impaired lung function. Average levels detected in e-cig vapor lead to estimates of exposure 2.6 times lower than the allowable limit for medicines. One single e-cig exceeded this limit by 10 percent. Lead is a probable human carcinogen that is naturally present in the environment, and was detected in the vapor from all tested e-cigs. On average, exposure levels were 7 times lower than limits for inhalable medicines, although the vapor from the device with the highest quantity detected had 55 times more lead than that from the device with the lowest quantity detected, suggesting notable variation between devices. Nickel is used in making stainless steel, and is present in ordinary air. It’s a known human carcinogen, and can impact lung function, but the most serious health problems (aside from allergic reactions) have occurred in those working in environments with very high nickel levels. Nichrome wire used in some e-cig coils contains nickel, but average exposure levels are 5 times lower than limits for inhalable medicines. Aluminum is present in the atmosphere (much more so in urban areas), and exposed workers have had impaired lung function and damaged lung tissue, although findings on this haven’t been consistent. The atomizer body and coils themselves are likely to be the main sources of aluminum from vaping, but exposure from e-cig vapor is estimated to be over 800 times less than the established occupational exposure limit. Barium is present in the air and mainly used in manufacturing, and one study associated it with pneumoconiosis (“black lung disease”), but others found no issues in exposed workers. The precise form of barium detected in vapor was not reported, and the only limit is again the occupational one, but assuming it was the form with the most stringent exposure limit, vapers’ exposure is almost 3,000 times lower than the recommended limit. Chromium is present in small quantities in air and in much higher levels in cigarette smoke, and one form of it (chromium VI) is a human carcinogen. Although the form of chromium in e-cig vapor wasn’t stated, the authors argue that chromium VI’s instability means it’s unlikely to be the form present. Vapers’ exposure (assumed to be from coils and atomizer materials) was estimated to be 30 times lower than the limit for inhalable medicines. Iron is an essential nutrient for humans, and is used in the manufacture of atomizers and coils. Using the occupational exposure limit (and assuming iron oxide was the form detected), vapers’ exposure is over 600 times lower than the safety limit. This is present in the air (more so in industrial areas), and high levels of exposure can lead to a neurological condition called manganism. Levels found in the one e-cig with detectable quantities are estimated to lead to 25 times less exposure for a vaper than the minimal risk level. Strontium is present in the air, and although the radioactive form is a known human carcinogen, this was unlikely to be the form detected in e-cigs. There are no defined limits for comparison, but strontium was only observed in detectable levels in the test not accounting for background quantities. Tin has been linked to a benign form of black lung disease in workers exposed for between 15 and 20 years, and is likely present in e-cig vapor due to soldering joints. In the one e-cig with detectable levels, vapers’ exposure is estimated at over 3,000 times lower than NIOSH occupational exposure limits. This was again only detected in the Williams et. al. study, and assuming that titanium dioxide was the form detected, vapers' daily exposure (under the assumption that these were the more dangerous ultra-fine particles) is over 10,000 times lower than the occupational exposure limit. This is present in the air, and was only detected in the study which didn’t appear to control for background levels. Even then (and with excessive levels of vaping), exposure for vapers is estimated at almost 6,000 times lower than NIOSH occupational safety limits. Finally, zirconium levels in the one e-cig where it was detected would lead to exposure for a vaper of over 49,000 times lower than established occupational exposure limits. Although occupational exposure limits might not be applicable to sensitive groups in the population, and already-used coils could release more metals into the vapor than the fresh coils in these studies, the combination of vanishingly tiny levels of metals detected (ordinarily in the less reliable study) and the extreme assumptions about the number of puffs taken per day, the concern about metal exposure from vaping is obviously misguided. In fact, the available evidence indicates that the majority of e-cigs exposure users to only minimal quantities of metals, far below even the most strict limits designed to prevent negative effects on health. Vaping is unlikely to be completely and utterly safe (not much really is), but metals definitely don’t appear to be a source of genuine concern, especially for those only exposed second-hand. On this issue, vapers can definitively breathe easy.